When the TV news starts reporting that bears are raiding dumpsters looking for food to fatten up for winter, you know time is running out on bee season. Only one more inspection is planned after today's. Bees do have a tendency, though, to throw your plans to the wind. Today, for example, the goal was to assess colony strength (i.e. : how big the brood nest is and how much honey they have for winter). I wanted to at least find the edge of the brood nest and gauge what/if they needed to fatten up like the bears. At first glance, I was skeptical; barely any traffic on the landing board. I was ready to give them the half pollen patty we'd brought. A peek through the window, though, told a very different story: the colony is still pretty darn big with no indications of downsizing (although with cooler temps on the way, that should happen soon). The new goal became to pull out excess honey, to prevent any thoughts of late-season swarming. What constituted "excess" was to be determined upon finding the edge of the brood nest. Several combs of uncapped honey needed to be moved before we found anything harvestable. It was when we finally came upon the really nicely capped combs that the gentle hum of the bees began to grow loud. 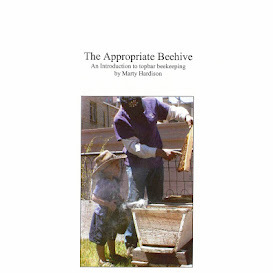 The voice of the hive told me that we were either very near the brood or the bees had begun to lose patience with me. This late in the year, bees tend to be a little protective over their stores so (despite fully trusting my UltraBreeze) I decided that I didn't need to see the brood nest, quickly pulled 2 honey combs, and called it good. A long time ago I read that a beekeeper needs to plan for the unexpected, so fresh top bars were in our kit. The colony now has two small combs they had already started plus two blanks to keep busy with. That's what I consider supering with respect to a TBH. If the hive was in our own backyard we'd probably check on them again around the equinox, but since the hive is 15 miles away we may skip it and just do final prep for Winter around Halloween. How well I know that 'gentle hum of the bees' turning loud. :) What is the "UltraBreeze" that you're referring to? A bee suit? A fabric softener sheet? I couldn't watch the video. It says I need a plugin. I'll ask my daughter when she visits this weekend. So funny @Solarbeez! The UltraBreeze is a bee suit. indeed. I will write a post on it soon, now that I've had a chance to wear it a few times.